This script allows you to create “battle test profiles” which will be used to set up your battle test rather than the default battle test UI. A battle test profile is simply a troop event page. 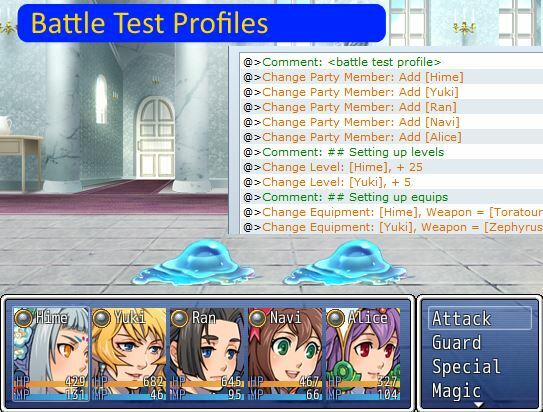 You can specify any number of actors that will participate in the battle, use event commands to set up their levels, equips, and any other custom data provided by other scripts that the battle test UI does not support. By putting together a battle test profile, you can store different test profiles as separate pages, allowing you to re-use them for future tests. Utilized fully, you can greatly cut down battle testing time. This will tell the engine that this page is used for setting up your battle test. You should have it run on turn 0 because it doesn’t run automatically. Now you want to add some actors to your test battle party using the “change party” event command. Any actors that you add will appear in the test battle. You can then do anything you want, such as changing their levels and equips, adding states, and so on. If you want to save this test profile, simply remove the comment at the top so the engine doesn’t automatically try to read it. I haven&apos;t tested the script yet, but there&apos;s no TH::Battle_Test_Actors::Regex. Did you mean TH::Battle_Test_Profiles::Regex? My dropbox version doesn&apos;t match the one in my project. There are a number of other changes that were not committed either as a result. I just copied the script over to dropbox. See if it has been updated.